Q: So what does Cloud Dine Systems do? A: We make mobile restaurant management systems that increase staff efficiency and increase restaurant profitability. Our first product is a restaurant point of sale system using wireless tablets and cloud services. Q: Could you give me an example of what that means? And use non-marketing speak please. Q: Ok. You got a minute starting now. A: Think of your favorite restaurant. Think how busy and hectic it is during the dinner rush. That’s just the wait & bus staff you see in the front of the house. Lots of running back and forth. Q: I get it. Very busy. 45 seconds. A: A server does this for every order: Get order from customer. Write order on paper. Walk over to point of sale terminal. Wait till free. Enter order. Order prints in kitchen. Q: Sounds like all the restaurants I know. 30 seconds. A: We made a point of sale system that wait staff take to the table with them. It uses wireless tablets. Ordering is now: Get order from customer. Enter order on tablet. Order prints in kitchen. Q: Wow! Wait staff will love you. Their feet will kiss you, if they could. 15 seconds. A: Even better, with the extra time wait staff can serve more tables and provide quicker service with better accuracy. (Plus no more running back to the table apologizing about being out of the special.) 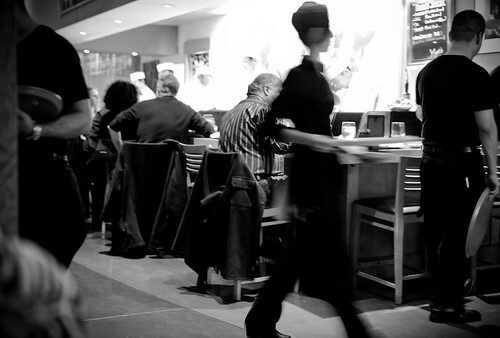 Better customer dinning experiences means increased tips = Happier wait staff. Serving more tables reduces the cost to serve each customer. A more profitable restaurant = Happier owners and managers. Q: Ah. Now I see what you do. Posted in Cloud Dine Systems, Front of House, Intro, One Minute Example, Restaurant.Tagged Front of House, One Minute Example.